Nanaimo Balls are a twist on the classic Canadian dessert recipe, Nanaimo bars. 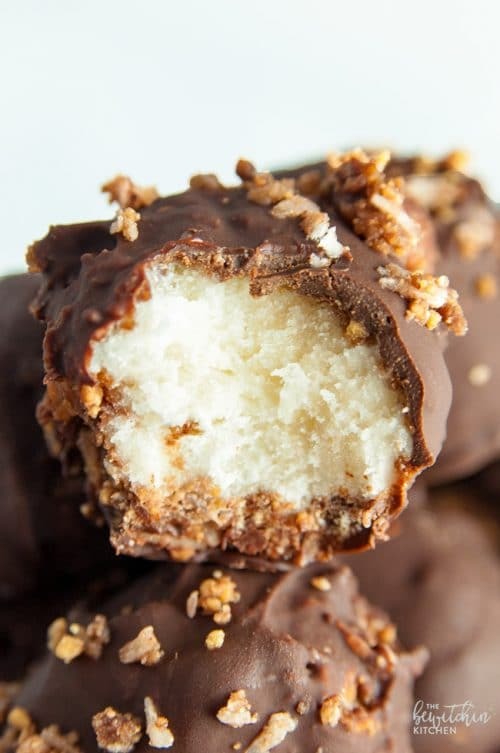 Making this sweet confection, a bite-sized treat in the form of easy coconut balls. No Bake Nanaimo Balls are a twist on the classic Canadian dessert recipe, Nanaimo bars. Making this sweet confection, a bite-sized treat. Nanaimo Balls are a twist on the classic Canadian dessert recipe, Nanaimo bars. Making this sweet confection, a bite-sized treat. In a large bowl add the graham cracker crumbs, coconut, pecans, melted butter, and cocoa powder. Stir and set aside. In a smaller bowl, mix up the filling ingredients. Take the filling, roll in a ball that’s about 3/4″. Sprinkle the chocolate coconut mixture on top and roll until the filling is surrounded. Once all the balls are rolled out and placed on parchment paper, stick them in the freezer for 30 minutes. Meanwhile, place a glass bowl over a boiling pot of water and add the semisweet chocolate and butter. Stir until smooth and glossy. Remove the balls from the freezer and roll in the melted chocolate. Place back on the parchment paper and top with any additional coconut mixture. Let stand a few hours until chocolate is set, or toss them in the freezer to speed it up. 0 Response to "NANAIMO BALLS"